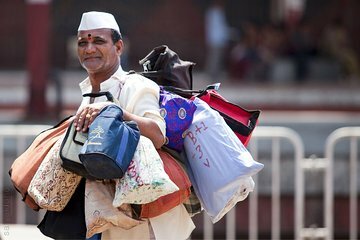 Watch the city come to life on this private tour that highlights the incredible work done by Mumbai's dabbawalas and Dhobis. Your expert guide will share insight and information into how the lunch-pail men who deliver freshly made food from people's homes to offices with 100 percent accuracy. Then you'll see Dhobis--Mumbai's traditional laundrymen--washing customer's clothes in the massive open-air ghat. This unique tour showcases two of the city's most interesting professions and offers insight into the daily life of locals in this thriving city.